On arrival at airport/railway station, our representative will pick you up and transfer to the hotel. Check in at the hotel on arrival. Freshen up and relax. Later, go to pay a visit to the famous Meenakshi Temple, Thirumalai Nayak Mahal and Mariamman Teppakulam. Once through with the visit return back to the hotel. Overnight stay at the hotel. On the second day of the south India religious tour, you will visit Rameshwaram, a holy city. Post-breakfast check out of the hotel and drive to Rameswaram. On arrival in Rameshwaram, check into your pre-booked hotel. Freshen up and relax. Later, go to visit the Sri Ramanathaswami Temple. This temple has 22 holy springs known for their therapeutic value. You will also be taken for a visit to Ghanthamathana Parvatham, from where you can get a beautiful, view of the island. Return to your hotel for overnight stay. After breakfast, check out from the hotel and drive to Kanyakumari. On reaching Kanyakumari check into the hotel, freshen up and relax. Later, visit the Sri Kumari Amman Temple. 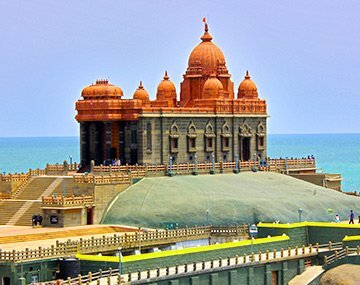 After darshan, go to visit the Vivekananda Rock Memorial and Thiruvalluvar statue. A boat (Direct Payment) will take you to the beautiful memorial spot. After visiting the memorial, return back to your hotel in the evening for overnight stay. After breakfast, check out from the hotel and drive to Kovalam via Thiruvananthapuram (Trivandrum), the capital city of Kerala. The Padmanabha Swami Temple, Kuthiramalika Palace, and the Napier Museum are some of the heritage attractions in Trivandrum. After visiting Trivandrum drive to Kovalam. On arrival in Kovalam, check-in to your hotel for overnight stay. The fifth day of south India tours is at your leisure. Evenings are reserved for a visit to the Samudra and Light House Beach from where you can see the beautiful sunset. Return back to your hotel and have a comfortable overnight stay. Your south India tour concludes today. Post breakfast, check out and transfer to Trivandrum airport/railway station to board a flight to an onward destination. Replete with various temples, shrines and other places of reverence, south India attracts travelers effortlessly. From Meenakshi Temple in Madurai to Sri Ramanathaswami temple in Rameswaram, Vivekananda Rock Memorial in Kanyakumari to Padmanabha Swami Temple in Thiruvananthapuram, south India’s treasure trove is full of temples known for their religious and architectural significance. Apart from the temples, south India is also well known for the places with immaculate natural beauty and Kovalam is a fine specimen of this kind. Our south India religious tour package introduces you to the religious side of south India. In our existence of several decades, we at BookOtrip have facilitated several devotees with their religious tours. And those planning a trip to explore South India on a religious tour are no exception. With a vast vendor network spanning several cities and a great understanding of prominent temples and their religious significances, we find ourselves, best positioned to offer pilgrimage tour packages to South India. You can book tour packages on your own or call our trip experts for assistance. If you want any change in the itinerary, you can suggest the same to our trip experts who will revert back to you with a customized package.